The following is an angel of afterlife extract on death from the surveys completed for my Higher Degree dissertation at Monash University in Australia. She would often doze that night, and we would all wait to see if that breath was her last. She took a deep breath, and my grandad looked up, so did we (there was approx. 20 people in the room) My grandmother went to Heaven in the arms of Two angels. We all saw them. Down through the centuries the angel, in all it forms, has been openly portrayed in art, documented in the literature and accepted as part of life. Yet, I wonder, how many people today would actually call upon them in times of crisis and expect them to appear? There seems little reason to doubt the integrity of this account and the probability that it can be corroborated by such a large number of witnesses only adds to its credibility. So, do we only materialise angelic beings in our hour of need and if so, do they take on the form that supports our own religious beliefs and convictions? I was brought up in the Catholic religion but have never encountered an angelic being. Have you seen your angel lately? My family was of the Christian faith, but we didn’t attend church. At the time, I had probably been to church 4 or 5 times in my life. I have already taken the survey and I didn’t include this account of angelic contact. When I was 7 years old, I was very sick with some kind of childhood illness, I don’t remember exactly what, but I was laying in my bed and 3 angels appeared above me. Their features were indiscernible as they were composed of a brilliant white light. They were hovering above me and I knew they were discussing me, but I couldn’t understand what they were saying. This vision only lasted a few moments, and when they were gone, I knew my illness was over. The next day I was fine. I’ve never told anyone this story, I don’t really know why, but I think back to that event often. Im curious to know whether you were a Christian at the time of your apparition. It seems to me that Christians tend to see Jesus, Mary, angels etc and this is not the case for those of other faiths. If you were a Christian at the time, presumably you had had some introduction to the concept of angels – perhaps through Christmas rituals etc? Spiritual beings seen when near death or during an Out of the Body experience (OOBE) are often interpreted according to the beliefs of those seeing them. That doesn’t mean to say they are not real. So a Christian will see angels, the Virgin Mary or Christ, those of other religions may interpret the beings of Light as connected to their religion. Of course since we all live on in the Spirit world it is perfectly possible for Christians to see Christ or his mother, and angels are just another word for highly evolved Spiritual beings. 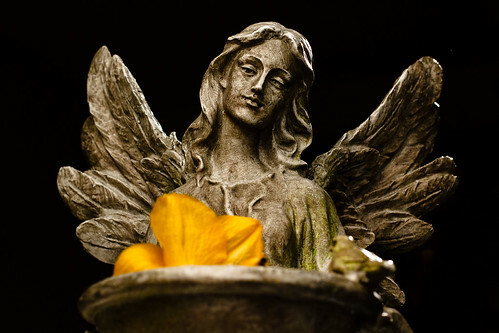 Our Spirit guides may be described as ‘angels’. However most reports, if not all, describe these beings of Light as unlike the usual depiction of angels in that they don’t have wings. We all see life through filters, so why not death and the events that surround it? We don’t suddenly change because the Grim Reaper is in the room. Do you think we can/do/will evolve to become angels or the equivalent Tony? It isn’t something I’ve thought about – or indeed aspired to 🙂 as yet. The reason we are here, I believe, is to evolve. We continue to evolve in the world of Spirit. We’re told there are several levels and so when we tire of an idyllic Earth-like environment (the Third Level I believe where most of us go to after death) we can progress to the higher levels. I imagine at the highest ones we dispense with physical-like forms entirely. Maybe ultimately we re-unite with Source. MMm. Just thinking about what you’ve said Tony on a personal level. I came into this world kicking and screaming because I didn’t want to be here – didn’t like the coarseness of the energy. I wonder if this has to do with the the energetic ‘coats’ I have tried in elsewhere. I quite like the term ‘Source’ rather than others like ‘God’. It can encompass concepts such as the intelligent ether or ‘i-ther’ which scientist Ronald Pearson proposes in his theories, including his Big Breed Theory. Even atheists and agnostics are able to accept ideas such as this – a Universe slowly evolving and guided by an intelligent matrix also evolving, and which could be described as Source. As to a dark void if we are all wrong, that not only seems inconsistent with all the evidence, but as they say: we shall wait and see or wait and not see. Either way, we won’t be disappointed! For my own edification, could you explain how it is that atheists and agnostics can accept the notion of ‘an intelligent matrix’ please? I must admit I haven’t considered the idea of an evolving Source. I assumed it already is evolved but are you suggesting that our evolution feeds its? The Campaign for Philosophical Freedom, which you can find on the Net by Googling the name, promotes Ronald Pearson’s theories and Survivalism, i.e. non-religious Spiritualism. The borderline between science and religion is becoming blurred anyway. With Quantum and String Theory concepts of alternative realities/other dimensions/parallel universes and with Quantum Physics suggesting there needed to be a conscious observer before matter could even exist, plus Einstein and other scientists saying the material world is an elaborate illusion, science is getting as mysterious as religion – and this is just the beginning of it. I tend to believe the Intelligent Design behind all life and the Universe is constantly learning and evolving. An all-wise Creator at the beginning would hardly need to go thru the long process of evolution, and I have difficulty with accepting such an entity would create Nature in all its barbaric cruelty. For me Pearson’s theory of a conscious matrix or energy permeating the Universe or multi-verse, what he calls the i-ther, is a viable one, and I would suggest it like everything else is constantly evolving. Pearson and the Campaign for Philosophical Freedom fully accept the afterlife as a scientific fact rather than a religious one. Religion tries to explain what science cannot yet explain. I do believe that love is the positive energy which helps everything to evolve and that we progress thru various Spiritual levels. Great teachers like Christ, the Buddha and non-religious ones like Sir Bertrand Russell, Mahatma Gandhi and some would say even Karl Marx tried to teach us the correct way to live. We also learn from experience and past mistakes, and of course, from karma which in scientific terms is the law of cause and effect. In short, I believe science will eventually discover that religious concepts such as that we are all basically connected/one and that we are eternal beings of Spirit or conscious energy will prove to be correct. Orthodox scientists are reluctant to accept some of the maverick theories like Pearson’s, but eventually they’ll have to. Einstein’s physics, as he himself admitted, is not flawless and is incompatible with Quantum Physics. Pearson’s theories are compatible with Quantum Physics, the continually accelerating expansion of the Universe, and with all things paranormal including the afterlife and a conscious entity behind everything. Tony Ive just had a look at the Campaign for Philosophical Freedom website and the name is certainly intriguing. I havent explored it in depth but it is certainly curious that philosophy is brought into the mix, along with presumably religion, spirituality, science and ??. For the members of the community here who are interested, the site has links to a couple of radio interviews which may be of interest. How did you come to be associated with the site Tony? I heard of the Campaign for Philosophical Freedom and Ronald Pearson, also Michael Roll who is behind the Campaign, via Victor Zammit, the ex-lawyer from Australia, who sends out a free weekly Afterlife Report. This has included, in the past, links to YouTube videos of Michael Roll among others speaking about the reality of the afterlife. I’m not actually a member of this Campaign, but I am very interested in their approach. Victor also writes a regular column for Psychic World. I’m afraid New Age and Christian culture leave me a little cold. People like myself, Michael, Ron and Victor tend to approach the subject of the afterlife from an empirical standpoint, i.e. by studying the hard evidence for it. This is where I believe Spiritualism/Survivalism can potentially win over so many people based on the evidence, and it can win over both rationalists/atheists/agonistics and people of the world’s different religions. The hardest to convince will be hardline skeptics who refuse to examine the evidence for survival, and the religious fundamentalists who also refuse to look at the evidence believing it to be the work of the Devil or the Islamic equivalent. I am familiar with Victor and his work Tony although Ive not met him. Re the skeptics and fundamentalist, I prefer to leave them alone. Most of them probably have a vested interest (as many of us do, I guess) in holding onto their beliefs and who are we to try and convince them otherwise? I believe that religious belief etc can have both ac debilitating and a supportive role in people’s lives and if that is what the believers need to get themselves through, then so be it, I think. I too am not much of a New Ager. Somehow the movement attract people who don’t ‘speak’ to me and rather than pretend they do, again I find it easier to let them be. I guess this is why Psychic Revolution exists. I couldn’t find what I wanted and so I’ve created it 🙂 and happily, others are comfortable here too. Bingo! The ‘Source of All Things’ and/or the ‘Collective Conscious’ are terms I too believe in wholeheartedly. I honestly believe these terms more accurately describe the ‘next life’ or passage from this plane into the next than most other terminology. Whether there are 3, 7 or 11 realms/planes, depending on source of info, the bottom line is it’s not here in the physical plane and our Spirit Evolves. Well, in this case Felbian I will allow Bingo but only if there is no exchange of money! If our physical body is like a heavy coat we put on, is our challenge here to lighten that coat so that our true selves shines through more and more? Maybe yes, maybe not. Why be given something to then try and dissolve it? The physical form is what I wrestle with most. And, how do we distinguish the true self/the soul/the essence from the personality of another? I had a chance to quiz the ghost in my apartment via a medium friend. He had passed in about 1867, and was still present on earth, sensate, able to communicate, etc. I asked him a little about the afterlife — He said he believed in God, because he had been raised as a Christian — and yet there was no ‘heaven’ for him to go to, and I asked him if he had any evidence on the other side of a God etc and he said no. His (obviously also dead) sister would occasionally visit him from another place, but he couldn’t say where the other place was. He indicated he liked staying where he was because he could psychically protect the space against other intruding spirits — they almost seem to establish a ‘home turf’ they can defend. They may have just been orbs of light or non-winged beings — I doubt they had visible wings as per Renaissance artworks. Or possibly the relative was psychically projecting a thought to everyone based on her own beliefs as she passed on? Underneath all this you have to question what sort of powerful psychic beings exist in the afterlife. Is there a ‘God’ in such a sense, and so on. My own father passed on a year or two ago and I sometimes wonder if he is still watching us all and whether he visits and so on. You’ve touched on a lot of topics here! First, to the survey. Initially, in my academic studies, I wasnt permitted to have any trail to source in the data. The post you are referring to came from that batch of surveys and so, there isn’t a way for me to follow up. I imagine again, from my reading that Christians tend to see angels with wings and halos and so, yes calling the being an angel may have been an externalisation of her beliefs or it maybe that beings from elsewhere are sensitive to the individual’s beliefs and are accommodating. I have kept the survey this way to protect the anonymity of the participants. Maybe that needs to change now and you may just be the catalyst. Out of interest, would you have stopped, if asked to leave your email address at the end of the survey? It would seem that the spirit in your apartment is/was stuck on the earth plane. That would probably account for his lack of awareness of other worlds. There are people who are real life ghost whisperers who do release souls, to allow them to move on. Maybe hell is just being stuck in a Groundhog day scenario?? And, yes, I think you are right about spirits being territorial. Somehow they attach to a physical locale and think there is some home-town advantage for them to stay near and protect it. You may be interested in having a look at the active chat that going on over here at https://psychicrevolution.com/paranormal-research/paranormal-questions/ This conversation started with a book review, followed through with What’s Your One Big Question, has been fired by the need to know what we do, over there ……. and it is a bit jumbled but there is some interesting insights in the text. Thanks for commenting on this post Sean. > Out of interest, would you have stopped, if asked to leave your email address at the end of the survey? It’s not too late for you to put out a call to respondents as a second pass in particular requesting clarification from respondents of interest who might be revisiting your site. Re the ghost being stuck in the earth plane, after I lost contact with the original medium, I went to a local inner city spiritist church in Sydney but came away quite disappointed with their talents and advice — none of them seemed to possess the ability to communicate with spirits at all on questioning, unlike my friend, and their advice was to ‘encourage’ the spirit to go to ‘ the higher plane’. However, as I don’t have any scientific evidence or knowledge of the existence of a higher plane, I was loathe to recommend to my spirit friend that he attempt this, not knowing if it was a good idea or not, and not liking to tell people, alive or dead, what’s good for them. He seemed happy where he was watching my computer, stereo gear, TV, and cars passing in the street. I believe I know the cemetery and rough location where he’s buried from what he’s told me, and have gone to some lengths to get the historical records for that cemetery, but ended up being unable to obtain them. Future project, perhaps. He IS stuck in groundhog day (as are we all in this industrial society of long working days). I don’t know the lifespan of a ghost, there are ghosts that are over 1,000 years old out there it seems. The physics and so on of a being that has lost all its biological organs being able to retain biological senses and even learn new things is the first ‘impossible’ thing to get your head around in this area (rather than the idea of ghosts being some sort of vestigial engram in the ether or a replaying psychic video of an event with no real consciousness). Then the idea of being able to wander through walls and floors etc, the energy source for continued existence and so on. My friend being some sort of ‘biological antenna’ for this, and being able to communicate psychically over very long distances (this seems to be a strongly female trait and to pass down through the female lineage, although there are also psychic males). The possibility perhaps of some sort of ‘parallel universe’ energy or existence that powers all this. While sceptics would say belief in the afterlife is just wishful and magical thinking for people who cannot accept their limited lifespan and never want to die, and cannot be supported by the facts or science as we know and understand it today, it seems that there is ample evidence out there if you go looking for it. My own background is in the physical sciences (physics, chemistry, etc) as well as social sciences — psych, sociology and so on — hence my ability to do survey and research construction ; ) — but am intrigued by trying to understand the science behind the existence of spirits and unravel the forces at work. Are they ‘magical’ in a true ‘supernatural’ sense, or a set of quantum, sub-atomic and multi-dimensional physics phennomena that we are not even close to understanding with our current knowledge base. Is all this explicable with some sort of physics? Thanks for your response Sean. Ill read and respond. You make two good points. I have never been to a Spiritualist Church in Australia and, this may flush out a few members who are reading this, because I’ve been told that there just isnt the quality of reader in Australia that is to be found elsewhere. I know that is a gross generalisation but, rather than have a bad first experience, I’ve chosen not to go at all. Then again, unlike you, Ive only ever shared my homes with the living. Your second interesting point raises the issue of whether we really know about the existence of another place. Can we truly know something if we have never knowingly experienced it? Taken for example this analogy, I’ve never been to Vietnam but I presume it exists, just like others tell me. I have no reason not to believe in its existence and my intuition tells me that that country is where people say it is. But, ultimately, I only have their word and my intuition to go on. So, can we genuinely recommend that a spirit pass over and help them to do so? On many levels, we will probably only do this is it reflects our values and beliefs. I’d love to know how you knew that ‘seemed happy’ Sean. I don’t think Ive linked happiness and spirit in the same sentence. Again, interesting point. I’ve always thought of spirits as being somewhere on the continuum between neutral and benign, and malevolent. Phew! Thats my response to your science/paranormal paragraphs. My guess is that science is playing catch up and many of the things that are currently regarded as being ‘out there’ and paranormal will one day be understood and brought in from the margins. Take, for example, scientists have just found particles that do go faster than the speed of light. From my understanding, this rewrites a few laws and probably many, many books. So, is that noise Einstein rolling over in his grave? I like to think there is a science aspect to all of this. It satisfies one part of my brain. I also need to know there is a spiritual side that is bigger than myself. Thank you Sean. I’ve enjoyed responding. > In 1,000 words or less, please discuss: Do Spirits feel the way we do? Well, yes, absolutely, the one in my apartment just continued on after death — same intelligence and personality as before. Happy to float around forever watching technology changing. He made the point to me that people’s way of life had changed considerably since his day — really in just a few generations — and I always find it interesting the same dwellings they occupied still exist and are in use — although in the case of this neighbourhood it seemed that the local dwellings had probably been demolished twice over in the intervening time — which was one way of verifying my medium friend’s account as non-fraudulent, as the ghost described the housing he used to live in, verified later with a local history book my friend had no prior access to! > I like to think there is a science aspect to all of this. It satisfies one part of my brain. I also need to know there is a spiritual side that is bigger than myself. Yes, by the way that spirits seem to be able to interact and converse in the afterlife, it seems there is kind of a ‘Force’ as in Star Wars out there somehow. Not necessarily magical or ethereal but just hard physics we don’t yet understand (take note various ‘Skeptics’ Associations, really material denialists, not true scientists). Some sort of pan-dimensional energy or force that exists in the interstices of the space-time continuum in the known universe. Another thing that intrigues me is the ability of people to tell the future (I know of one or two accurate fortune tellers in Sydney who can look ahead several years, plus people who see serious impending accidents etc within say a 24 hour period), suggesting they can can somehow reverse the direction of time and get some sort of emotional signal or information back! Being in computing, I wonder whether it is information transfer from perhaps a messenger spirit, or an actual ability to project one’s consciousness into the future or draw information back. I have an uncanny story of a blind Hungarian soothsayer in his 80s here who very accurately predicts the future for people, good news or not, although the messages are a bit hazy and cryptic which makes it hard to avoid the bad news — often things you couldn’t set up as a ‘self-fulfilling prophecy’ or want to! First, time probably doesn’t exist or if it does it is just nature’s way of ensuring that everything doesn’t happen at once (paraphrased). Where are the memories stored? In the ether – open to all? Are they stored in our genes? Our souls? Our own ethereal bodies? There is memory of place and so are memories stored in inanimate objects too? This article reminded me of when my own grandmother passed. I didn’t see the angels as your writer did, but I was in the hospital room with my grandmother when her time was nearing and she kept telling me that her mother and a brother who had passed were there waiting to take her home. She even pointed to where in the room she saw them. I do believe that we are met by family, or at least beings who care about us, to guide us to through the transition to the next dimension. Maybe we’re met by family and angels? I don’t know, but I don’t doubt it either. Thanks for this great thought provoking post. First, thank you for adding your website and photo to your post. Ive already checked out your website and hope that other members will too. It’s a wonderful thought to know that we go to the other side surrounded by family and friends. So, in a sense, while the process of death is very personal and no one can ‘do it for us’, maybe it is that we are supported, coached, coaxed, enticed and ultimately convinced that the other side is where we need to when I time comes. I’d like to think so. I’m sorry but now I really hesitate to say what is my very personal perception about discarnate beings. The point is that I have very deep perceptions which, from my point of view, don’t produce any knoledge. There isn’t, or at least I don’t know,any human language which can translate my perceptions into knowledge . Generically I can say that only if we perceive deeply what means to be a living being and why living beings have to change their lifes, we understand correctly the life of discarnate beings. The explanation because living beings exist and change isn’t inside a knowledge, is inside a very deep perception. The best way to “know” something about discarnate beings is to have personally that perception. Sorry but I ‘m not able to answer your questions. Virginio said: “There isn’t, or at least I don’t know, any human language which can translate my perceptions into knowledge. Generically, I can say that only if we perceive deeply what it means to be a living being and why living beings have to change their lives, only then can we understand correctly the life of discarnate beings. The explanation, because living beings exist and change isn’t inside knowledge, it is inside – a very deep perception. I have to agree with this description and also feel confident in saying that this is why there are so many books, videos etc on the subject of the dis-incarnate and the return to physical Life after Death. To put into a physical world reality something that is so completely beyond it, is, well, impossible. I believe this is why people who have personally experienced death, and have been revived back into this incarnate world, try, as best they can, to describe the experience. Yet, no matter how acute the language, how precise the wording, it pales in comparison to the experience. I think what Virginio is saying is that unless you have experienced this crossing between realms, it’s impossible to project the feeling, thoughts, emotion, etc of that experience to others. If I read you correctly, I think you answered it very well Virginio! Perhaps, it is like love Dave – impossible to express fully in words – and that doesn’t stop up trying! I understand and probably agree with most of what you are saying Virginio. However, I question whether the ego of a discarnate being actually changes that dramatically if the being believes he is still alive or is still so strongly connected to the physical plane that he continues to inhabit it. Perhaps even, it is ego that binds him to this plane? Why are all my words so inadequate? Here am I writing about dead beings have beliefs and inhabiting space when clearly this isnt strictly true? My real problem in talking about the persistence of ego and life after death is that all what you can say is strictly connected to the “level” of reality in which you live. As a consequence, because of the different realities you can live, you have different explanations. So, I can just talk from the point of view of my reality and I don’t think at all that what I may say is part of the experience of anybody else. In “normal perception” concepts, sensations, languages, living beings are separated one by one. In abnormal perceptions, which for me is the normal, concepts, sensations, languages, living beings are not separated. Unfortunately the languages we can use, are based or on separations or on unification among parts of reality. But in abnormal perceptions there isn’t any separation or unification among some parts of reality. In abnormal perception, my perception, life and death are completely mixed. By the way, the abnormal perception isn’t the ideal life at all and the Ego isn’t at all an obstacle for anything. The normal ego after death change because it looses the body. It’s a big change with a lot of consequences and usually it’s a very different experience for each one of us. Yes I mark the distinction between us and other worldy beings because it’s part of my normal daily life the perception of a lot of other beings who live in ” layers of reality” which are not human layers. Generically we call all those beings ” spirits “. -The most simple and common way to perceive them is to “humanize” them , which means that we perceive them using our deep ego and relating them to our ego’s languages. -The less common way is based on the possibility to live into some dimension not related to any ego -also spirits have their kind of ego!. I never thought about spirits and egos before Virginio but, given some exhibit personalities traits, I presume this is an outward expression of ego. Is this the way you understand these workings? Is the ideal to live without ego? If if persists after death, can we survive without it? You seem to be making the distinction between how we perceive other worldy being. Perhaps we do sense an angel and, in turn our mind (as it often does in everyday life) steps in to fill in the gap – ie it adds shape to what we have perceived. And the result is what we call an angel. Presumably though angels are culturally based. Someone who lives in the remote Himalayas and has never seen an image of an angel would, presumably, not describe seeing something which was later named as an angel? Thank you for joining the conversation Virginio. Basically we are human beings and as a consequence also in deep perception we have got the aptitude to produce the identification of extra-normal phenomena using human identifications. This is the reason because we may see “easily” angels and other kind of spirits but not their real deep extra-human shape. Actually we can’t see the real shape of angels, we just can feel it at a very deep level of perception, but in that dimension words are not useful anymore. Ciao, virginio- I’m sorry if my English is not good enough.